Less Housekeeping – Consumed in the process! 100% natural lubricant - improves performance & increases life of cutting tools, taps, & saw blades. Good for metals, wood, rubber, & most plastics. Especially effective on aluminium and other non-ferrous metals. Coolube® 2210 is formulated as a metal cutting oil and lubricant for metals, wood, rubber, and most plastics. It is 100% natural, non-toxic, non-staining, and will not oxidize (become sticky or leave a residue). Coolube® 2210 cutting fluid does not contain any ingredients currently recognized as hazardous by OSHA, IARC or NIP. Coolube® 2210 machining oil will never cause dermatitis and is formulated from cosmetic grade raw materials, which makes it entirely worker and environmentally safe. 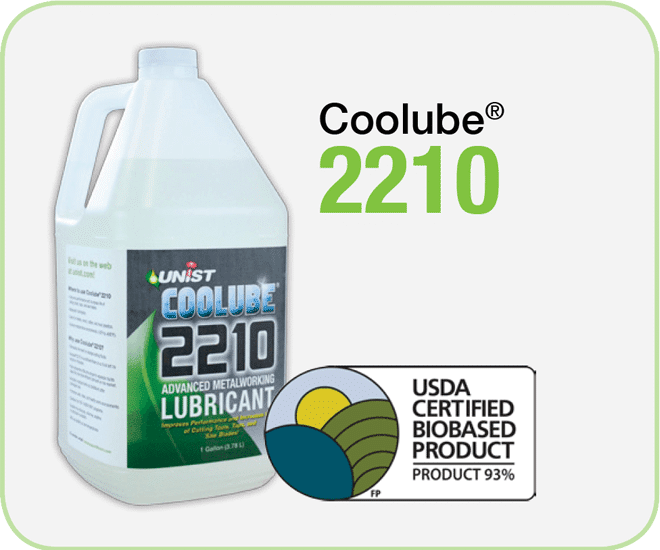 Coolube® 2210 is a USDA certified biobased product.